Educational ABC, Number, Music, Animals, Colors and Musical Instruments Activity Cube for Baby, Toddlers and Kids - Perfect Learning Toy Present For Boys & Girls Aged 6 months to 3 years old. The ideal Birthday gifts or Christmas presents to learn. Our standards of quality and safety mean that all products have been tested and evaluated to conforms to global toy safety standards (such as Europe Safety Standards of EN71, CE, RoHS, Cadmium and Phthalates or USA's ASTM F963, CPSIA, etc...). Also are free of BPA, phthalates, and PVC. Enjoy Countless Hours of Fun The Learning Cube has 6 functions for your little curious explorer to discover with a simple press. Each press is full of surprises as they learn alphabet, numbers, color, animal sounds, music instruments and fun music! "This educational toy does a fabulous job of engaging youngsters, stimulating and rewarding their curiosity with essential sights, sounds, songs and knowledge. The Learning Cube's high level of interactivity is a key factor in its ability to keep kids happily absorbed. Each of the cube's six sides contains a large, colored button that takes children on a different learning adventure. 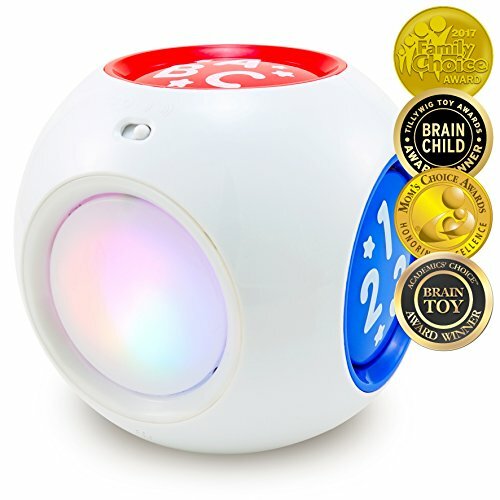 Kids learn the alphabet, numbers, colors, entertaining animal sounds, musical instrument sounds and can play any of 10 favorite children's songs at the touch of a button. The child can also accompany any of the prerecorded songs by tapping the musical instrument button or animal sounds button in time with the tune, an invaluable activity that promotes rhythm and musicality." Family Choice, Mom's Choice Gold Metal, Academics' Choice & Tillywig Brain Child Award Winner 2017! Great top gift idea for little infant and toddlers; boys and girls. Sings the alphabet, numbers and color song! Different colors of LED lights up on the color side. Skills learned include alphabet, numbers, animals, colors, creativity and imagination, music, logical thinking, motor functions and dexterity. Requires 3 AAA batteries (included); intended for babies, toddlers and early learners of 6 months to 3 years old. Manufacturer: Best Learning Materials Corp. Publisher: Best Learning Materials Corp. Studio: Best Learning Materials Corp. If you have any questions about this product by BEST LEARNING, contact us by completing and submitting the form below. If you are looking for a specif part number, please include it with your message.